Arid climates and urban desert terrain that require plants to endure long bouts of drought, heat and blazing sun take special plant choices. But they also offer up the opportunity to fill the landscape with plants that are some of the most sculptural in form. Plants as sculpture is a unique concept and one well suited to arid climates. 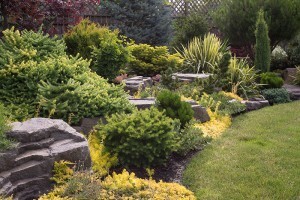 Plants that have stiff foliage, interesting growth habits or other unique features can be planted as focal points in the landscape; not requiring mass plantings or groupings of many different plants. Monstrose apple cactus, Cereus peruvianus ‘Monstrosus’, looks as if it is really meant to be a sculpture rather than a living plant. Growing to roughly 25-feet tall and 15-feet wide, Monstrose apple cactus has a columnar form, ridged texture; plus the occasional bloom. When planted among shorter varieties of desert plants such as white striped agave or bulbine plant, it stands out as the artistic feature. The round, symmetrical growth habit of the Mexican grass tree, Dasylirion longissimum, is a wonderful sculptural option for containers or low-maintenance landscape areas. Its leaves look spiked, but in fact are safe to touch. The Mexican grass tree has rigid, narrow leaves that grow in a radial pattern out of a large, woody trunk. The trunk itself, when the leaves are cut back to expose it, are an architectural element of their own. In summer, a tall, large spike bursts upwards exposing red buds, then creamy white blooms. A slow grower, it reaches up to 15-feet, giving it a grand appearance. Imagine it planted alongside the unique bottlebrush plant with its glowing red, wispy flowers or the more traditionally leafed, large growing, pink blooming Chitalpa ‘Pink Dawn’. 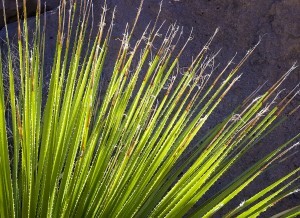 Green Sotol, Dasylirion acrotriche, also has a symmetrical round shape with leaves that radiate out from the center. But, it requires much less space than Mexican grass tree; at just six-feet tall and almost as wide. Plant en masse in groups of three as a living art installation with a stone wall as it’s backdrop. When choosing plants for arid climates or low-maintenance non-irrigated locations, remember that water-wise doesn’t have to be boring. Choose the right specimens and you can create a living sculpture garden.